at the foot of the Mendip Hills in North Somerset. The farmhouse dates back to 1750.
throughout with en-suite facilities in each bedroom. One room is available for self catering if required. ground floor for the convenience of guests. supplied with a colour television and hospitality tray. Parking is easy with plenty of space for all. this will be a benefit to all guests. 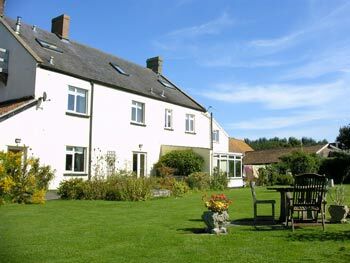 Stay in a beautiful first class Bed and Breakfast house in the Wrington Vale. prices from £50 include breakfast. From Winscombe only 10 minutes away by car you can walk along "Crooks Peak" at the top you will enjoy a panoramic view of North Somerset and on a clear day you will see coastline and hills of South Wales. Golf Clubs are within easy reach, Tall Pines, Lulsgate, Mendip Springs, Congresbury & Wedmore Golf Club all welcome visitors. hand made paper making in progress. up the hill to the Tor at Glastonbury. Georgian town of Bath - easy shopping if you use the Park & Ride scheme. National retailers and a wide range goods available from the independent retailers which line the narrow walkways. Wednesday or Shepton Mallet on Fridays. Stroll along the sea front at either Burnham- on-Sea or Weston-super-Mare. Travelling south on M5 take junction 21.
take first right at the signpost Wrington. Continue for approx. 3 miles going straight through the village. Do not deviate from the main road which is heading towards Blackmoor. Once out of the village take first right after the bridge. 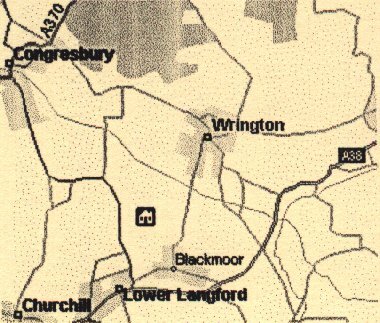 Coming from Bristol on the A38 turn right at junction with a signpost Lower Langford & Wrington, in the centre of the village nearly opposite the Post Off ce turn right to Wrington, take first left after the bridge.